Research led by Prof Michael Hutchings at the University of Sussex tracks how rising temperatures since the mid-17th century have wrecked a relationship, which relies on precision timing to succeed, between a rare orchid species and the Buffish Mining-bee which pollinates it. Prof Hutchings, Emeritus Professor in Ecology, said the climate is changing so rapidly that the early spider orchid cannot respond effectively, leaving this species, and probably many other plants with highly specialized pollination mechanisms, facing the threat of severe decline and possible extinction. Prof Hutchings said: "It is likely that many other species dependencies are also suffering from climate-induced changes to their life cycles. This study is, we believe, the best documentation we have as yet of such an effect and confirms with hard data the long-held concerns of ecologists. While this is especially bad news for the early spider orchid, the devastating impact of climate change is in all likelihood harming the delicate interdependent relationships of many species." However, rising temperatures have led to male bee flight, female bee flight and flowering all occurring earlier in the calendar year, but the timings of the three events are not changing at the same rate. This is causing an increasing frequency of years in which the sequence of events needed for successful pollination (male bee emergence before orchid flowering before female bee emergence) does not occur. The study shows that, since the mid-seventeenth century, as recorded spring temperatures have gradually risen, the interval between male and female bees emerging from hibernation has decreased significantly. Most critically, however, higher spring temperatures now make female bees likely to achieve peak flying more than a week before peak orchid flowering date. Whereas peak flying date of female bees preceded peak orchid flowering in only 40% of the years between 1659 and 1710, this figure has risen to 80% in the years from 1961 to 2014. But Prof Hutchings warns that unless the orchid undergoes rapid selection for earlier flowering following warm springs, it is likely that continued climate change will result in it always flowering after the emergence of female bees. 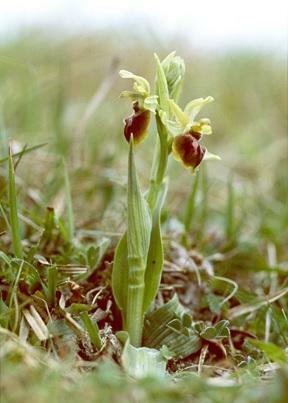 He warns that a programme of hand pollination may be the only means to ensure the early spider-orchid remains a presence in the UK.